This is great proof that beginners have a difficult time understanding the scope of work, roles and responsibilities. They only have a vague idea about this and are often looking for ways to validate if their understanding is accurate or not. And, if you are thinking this is only an issue for newcomers, you are wrong. Lots of managers/leads/coordinators also find the role definition/delegation of work to be an issue due to lack of clarity in this area- what to do yourself and what to delegate is often a dilemma for the QA leads. Just like some of you might think, I was wondering too that, “What if they don’t know, to begin with? Won’t they figure out as they go?” Yes, they do. But lots of time, efficiency and quality are compromised in the process. and any other area that the team member has an input on. Participating and contributing to test scenario creation Create Test scenarios for the module allocated to you, with in the set timeline and in the format already agreed upon. Basic Sanity and smoke test and determine- are we ready we test? 1) Do NOT create your Test cases, defect reports etc. with the expectation that if there are any problems with it, the team lead will find and fix them for you. Each individual is responsible for their work product and its quality. A team lead’s review is customary as an additional checkpoint and most often high level in nature. 2) Expect little to no hand-holding on a daily basis. No team lead should tell us what to do, every single day. 3) Communicate ahead in case of any concerns, red-flags or issues. 4) Unless your process restricts you from doing so, if you have any questions regarding the functionality or technicalities, please get in touch with the developers/BAs/other technical teams by yourself, without relying on your team lead to relay the information for you. Also read => How to build a successful QA team? Leadership in Testing Part 1 and Part 2 here. 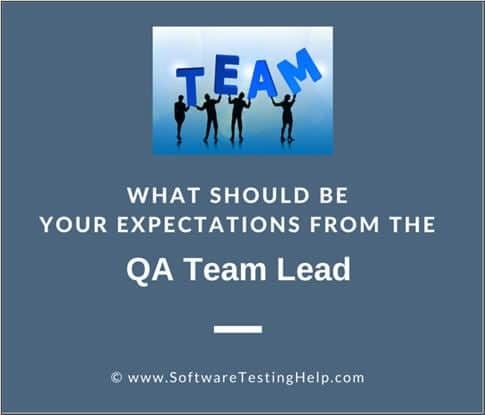 That is a quick wrap up on team lead and team member tasks and duties in a typical QA team. As always, please share your experiences, comments and questions below. It seems there are no sections on Automation testing – designing test scripts and frameworks or selection of automation tools that has to be decided by QA lead. Rest of the article is very informative and very helpful for budding QA lead. In past years you published different articles on different topics and all were helpful.Thanks for your help and support to all QA members. I saw your one of the article on ETL/Datawarehouse process. Can you please publish a series of tutorial on ETL/Datawarehouse testing process. Good article, outlines the workflow very well. Thanks , very informative to any QA . Thank you. Very clear roles. I believe the matrix needs to be created by System Engineering staff. This group should be working with design engineers prior to even the start of coding. The test manager will access this item ans assign staf to start drafting testing documents after its completion. @dinesh: Since automation is much more technical, it is usually sort of a work shop scenario and the team lead, team member difference is not as prominent. This is an attempt from a process perspective. @Dayle: Well, the process differs from team to team. This is from an internal QA team stand point…great input though..Thanks for your readership! Good article, I would like you to write one where you differentiate between QA lead and Manager roles also.